What Are Some Nelson Mandela Quick Facts? You might know what Nelson Mandela stood for, but how much do you really know about this inspirational man? Here is a list of quick facts about Nelson Mandela. Nelson Mandela was born July 18, 1918. He was born in Transkei, Africa. When he was born, his name was Rolihlahla Mandela. His birth name means "to pull a branch off a tree" and "troublemaker." He was given the name Nelson in school when he was seven years old. His father had four wives. Mandela is the youngest of all of the sons that his father had. In fact, he is the only one surviving. He grew up in a rural area, and he engaged in activities such as herding animals. As a youngster, he attended boarding school. His father passed away when Nelson was 12 years old. Afterwards, wealthy relatives had custody of him. He attended Fort Hare Missionary College; however, he was expelled for organizing a strike against the white rule of the college. He met Oliver Tambo, a great friend of his, at Fort Hare. He was working toward a B.A. when he was in college. He studied law at the University of Witwatersrand. In 1942, he joined the African National Congress. He became Deputy President of the African National Congress. He was a lawyer in addition to an activist and politician. He was sentenced to life in prison for life. He was imprisoned on Robben Island and then in two other South African prisons. During his time in prison, he was able to have secret talks with F. W. de Klerk, the President of South Africa. Due to these talks, he was able to be freed. While he was in prison, he was told that if he stopped his acts of violence, he would be allowed to go free. He did not agree to this provision. Mandela was in prison for over 27 years. In 1968, both his mother and son passed away. However, he was not permitted out of prison to attend their funerals. His only son passed away due to AIDS. In 1993, he shared the Nobel Peace Prize with F.W. de Klerk. They received this Nobel Peace Prize for getting rid of the apartheid system. In 1994, he became the first president of South Africa to be elected by a democratic system, and he became for first black president. Once he was finished with his presidency, he became an advocate in support of people suffering from AIDS. He has honorary degrees from more than 50 universities worldwide. A hobby of his was boxing. Nelson Mandela is a Christian. He was married in 1944 to Evelyn Ntoko Mase. They were married for 13 years. He married Winnie Madikizela in 1958 and they divorced in 1996 after 38 years. In 1998, on his 80th birthday he married Graca Machel, who was the widow of a former Mozambique president. He fathered six children, had 17 grandchildren and many great-grandchildren. In 2004, at the age of 85, he announced that he would retire from the public domain. Nelson Mandela was hospitalized for a respiratory infection for over a month in Pretoria, South Africa prior to turning 95. He was in serious condition with a lung infection and was on life support for almost six months. He died at home on December 5, 2013 at the age of 95. His body lay in state in Pretoria and a state funeral was held in Qunu. He was buried in the family graveyard in Qunu. Now you know plenty of interesting facts about this extremely important figure in history. "What Are Some Nelson Mandela Quick Facts? ." YourDictionary, n.d. Web. 23 April 2019. 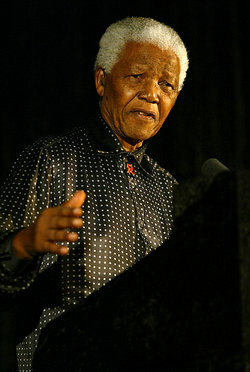 <https://biography.yourdictionary.com/articles/nelson-mandela-facts.html>. Where and When Was John Steinbeck Born? How Old Was Artist Salvador Dali When He Did His First Painting?